Some of the major companies in ingestible smart pills market comprise CapsoVision, Inc., Body-Cap Medical, Given Imaging Ltd., Check-Cap Ltd, Medimetrics, IntroMedic Co., Ltd., Philips Respironics, Olympus Corporation, and Proteus Digital Health, Inc. These firms are involved in partnership deals for R&D to exploit utmost potential. For example, September 2017, researchers designed a miniature medical chip dubbed as ATOMS. This chip can be employed in ingestible smart pills to treat & diagnose diseases inside the body, boosting the global ingestible smart pills market. According to the experts at Zion Market Research, Global ingestible smart pills market was capitalized at almost USD 743.6 Million in 2016. The global ingestible smart pills market is likely to create income of almost USD 1,147.6 Million by end of 2022, developing at a CAGR of 7.5% from 2017 to 2022. The ingestible smart pill lowered the gap between digital technology and healthcare, powering the global ingestible smart pills market. Smart pills are fundamentally small embedded electronic appliances and medical devices such as cameras, sensors, and trackers. These electronic gadgets can be effortlessly be swallowed and offer a complete assessment of the GIT (gastrointestinal tract), thereby boosting the global ingestible smart pills market. The appearance of these healthcare devices has dealt with the soaring requirement for enhanced monitoring and diagnostics, thus driving the global ingestible smart pills market. The elderly population is more prone to gastrointestinal diseases. Capsule endoscope has a major role in proper treatment and early diagnosis. With new hybrid imaging technologies and component innovations, more people undergo diagnostic & screening endoscopy. This specific factor is making a positive impact on the global ingestible smart pills market. Also, technology is seen as the upcoming big frontier by elements in the global ingestible smart pills market, where many of the most interesting and novel advances are likely to occur in the forecast period. The population with the utmost requirement for home health care services undergoes difficulty in managing these devices. 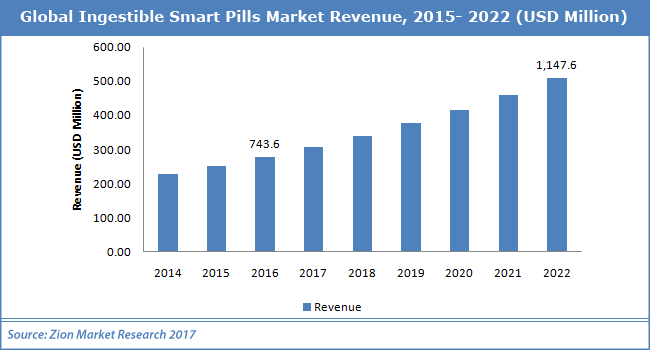 The ingestible smart pills market is divided based on component type into workstations and smart pills. Smart pills segment is likely to develop at quickest rate over the forecast period in the global ingestible smart pills market. Clinics, hospitals, home health care, and research institutes are major end-users of the global ingestible smart pills market. The hospital segment ruled the global ingestible smart pills market in 2016 in terms of revenue. The ingestible smart pills market is classified based on application into patient monitoring and imaging. Patient monitoring section is likely to develop at quickest rate over the forecast period in global ingestible smart pills market.